I’ve got a whole brain full of useless words and skills!!! What great beauty are you showing us….may I share this post on my fb page?The socks are gorgeous! Thank you… and they last longer than bought ones! That’s a little bit of Summer sun on your washing line.You must wear sunglasses collecting them. 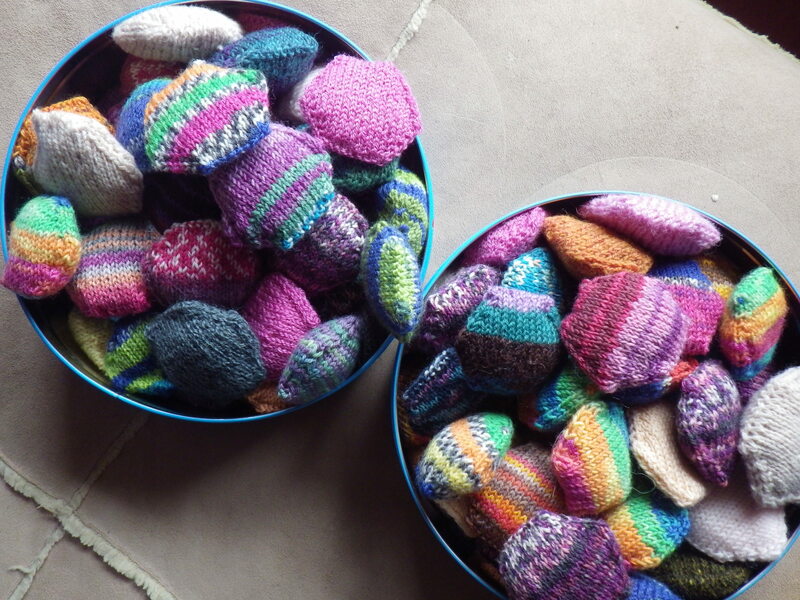 Good luck with the other 794 hexipuffs. That should keep you out of trouble. WE had blue sky for a bit of today… even so, the socks didn’t dry completely. My needles are never still!! Love the socks! I am in the knitting Sarah’s socks with Sarah Kal – working on pair number 5 of the year. I posted about what to do with leftovers, and hexapuffs came up a few times. You inspire me to actually do it…. 25 minutes? I like that… I was thinking wrist warmers, but how many of those do I really need? Dazzling footwear! If you run out of motivation with the hexipuffs, just make the centre of the quilt with puffs, and make the rest of stuffed squares to form borders. Speaking as a quilt maker, nice big borders have saved me from many a UFO! The hexipuffs are funny things…. because each one is sort of complete in itself, the momentum seems to keep going and I love seeing the collection grow… still 900 is a huge target! Once you get the hang of them socks are quite straightforward – I use a very simple pattern and all the interest comes from the self-patterning yarn. I’ve knitted so many pairs now that I don’t even need to look at the pattern! What a fun post! I share your love of socks, 5 needles, fine yarn and small projects. I really do love the hexipuffs. A quilt of them would be so ………right! Do the hexipuffs have to be the same fine yarn or is there room for thicker yarns too? Supposedly they are all done in 4-ply, but the yarns seem to vary greatly. This doesn’t matter too much, as they are quite forgiving when stitched together. I think by reducing the number of stitches and rows a little, DK hexipuffs of the same size would be perfectly possible. I started making them because I seemed to be accumulating huge amounts of left-over 4-ply (and I was given some too). Since there’s no sign of me running out yet, I haven’t explored other weights. If you had lots of DK oddments, you could make bigger puffs with the same number of stitches and would probably only need 600 for a king-size quilt!!! I love the beekeepers quilt! It’s one of those things I’ve always meant to do with my tiny balls of sock yarn. I really like the fact that there is no pressure with it – I am making it specifically to use up oddments, so I’m happy to just keep making hexipuffs when I feel like. Once I have a quilt, I’ll probably keep making them for other purposes anyway. Thank you… I never expected to be blogging about my socks! It’s funny how your personality shines through and you write in such an engaging way. I never thought I’d be reading about socks either! I adore your socks! I have never had hand-made socks, but perhaps when life slows down a little I will learn to knit at last, as I am a funky sock fiend. 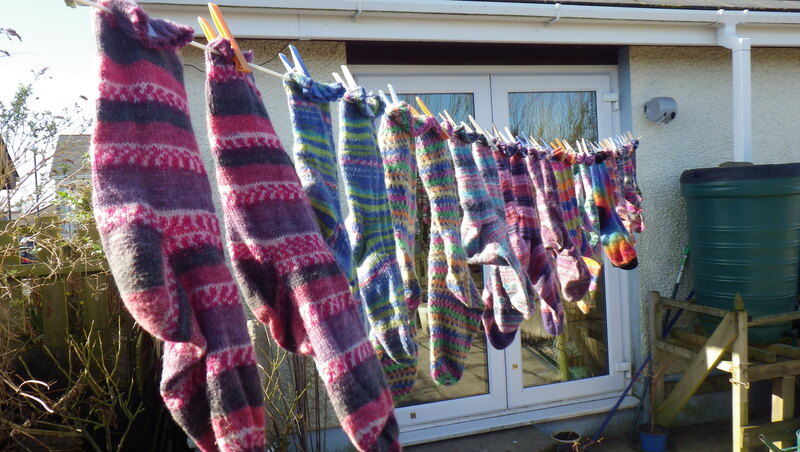 I think socks are quite easy to knit… but many disagree! They are great for knitting whilst traveling as they are small and don’t require the transportation of large quantities of yarn. And, once you’ve learned how to make them, it’s addictive!